The National Security Agency’s domestic surveillance operations hit the headlines last year to a volley of outraged objections from civil libertarians in the US and abroad. But while the news coverage has faded, the spying hasn’t – and a new lawsuit filed against the agency by the ACLU on behalf of an unlikely coalition of plaintiffs aims to change that. 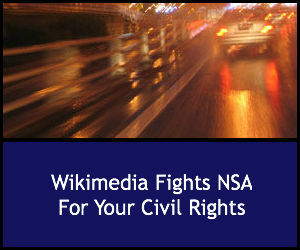 As Newser reports, the new suit, called Wikimedia vs NSA, was filed on March 10 2015 by civil rights watchdog the American Civil Liberties Union. The named plaintiff, Wikimedia, is the parent of popular online encyclopedia Wikpedia and several other online “wikis,” or online information communities. Wikimedia isn’t alone in challenging NSA’s right to spy. Joining the online information giant is a long list of plaintiffs committed to human rights and civil liberties including the Global fund for Women, the National Association of Criminal Defense Lawyers, PEN American Center. Amnesty International, Human Rights Watch, the conservative think-tank the Rutherford Institute and the Washington Office on Latin America. The suit challenges the NSA’s domestic operations as a violation of US cttizens’ First and Fourth Amendment rights. But it also alleges that the Agency’s snooping puts the entire Internet communications structure at risk with its “upstream surveillance” practices. In the old days, government snooping was accomplished by simpler means, such as intercepting a target’s mail, tapping phones or bugging rooms. In the digital age, though, it’s possible to expand the scope of spying on a mass scale, simply by tapping into the structures everyone uses every day to conduct business and make personal connections. That’s what “upstream surveillance” does. The Wikimedia suit, which also names the Department of Justice as a defendant, calls it the “suspicionless seizure and searching of Internet traffic” on US soil by NSA and its related intelligence agencies. Upstream surveillance involves is accomplished by tapping directly into the physical “backbone” of the digital communications structure that connects the US with the rest of the world. By jacking into the actual cables and routers that carry Internet communications, NSA can capture enormous amounts of data from communications while they’re in transit, either domestically or headed out of the country. The operation seizes both business and personal communications indiscriminately in a search for tens of thousands of search terms it considers sensitive. NSA isn’t alone in this operation, though. Investigative reports revealed that ajar US telecommunications carriers were only too happy to help, making their hard and software available to the snoops – and also, their customer databases. Wikimedia and its fellow plaintiffs charge that by tapping the “backbone” of the Internet, NSA threatens the very foundations of democracy itself. By capturing masses of data without grounds for suspicion, they say, NSA is violating constitutional protections against unlawful search and seizure, and threatening personal privacy and intellectual freedom. That’s why Wikipedia heads the list of plaintiffs in the case, which also names the US Department of Justice for giving NSA the green light on its domestic spying efforts. Wikimedia stands for freedom of expression and information – and the expansion of knowledge. It’s those principles that NSA threatens most, they say, by compromising people’s right to privacy and the ability to share information without the fear of government intrusion. But it’s precisely that freedom that concerns NSA and the other major players in the intelligence game, such as the CIA and State Department. The claim that free sharing of knowledge and information lets terrorists hatch plots and grow cells of followers that could one day destroy the country. Putting as many communications as possible through the sieve of red flag search terms is essential to protect the nation. Whether those concerns are founded or not, the NSA itself fell victim to the free flow of information when former contractor Edward Snowden famously blew the whistle on its domestic spying operations. Details hit the headlines and well-publicized investigations began, shining unwelcome light into the shadows surrounding the nation’s number one spy. Virtual Reality Technology: big Changes for business?